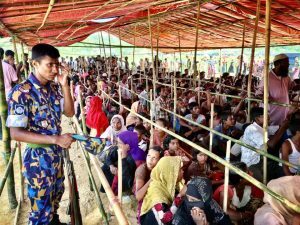 Bangladesh (MNN) — Myanmar and Bangladesh are currently in talks to repatriate Rohingya refugees. Myanmar’s military scorched-earth campaign began August 25th targeting Rohingya minorities in Rakhine state. The nation has received harsh international criticism for this horrific ethnic cleansing. The United Nations General Assembly committee demanded last week that Myanmar end the military campaign targeting Rohingya which has “led to the systematic violation and abuse of human rights”. According to CNN, the estimated number of Rohingya refugees is estimated to grow past one million in the coming weeks. And those arriving every day in Bangladesh are in desperate need. The International Research Committee says 40,000 Rohingya children currently need life-saving treatment for malnutrition. Three-quarters of Rohingya refugees have a lack of food and 95 percent are drinking unclean water. On Monday, China’s Foreign Minister Wang Yi proposed that Myanmar enact a ceasefire to end the ethnic cleansing, begin repatriation of Rohingya refugees, and work towards a long-term poverty alleviation solution. Aung San Suu Kyi, Myanmar’s de facto leader, said Rohingya who can prove they were residents in Myanmar would be allowed to return. But with their homes destroyed and their communities scattered, what is there to go back to? And is it safe or even advisable? Currently, Myanmar plans to resettle most returning refugees in new “model villages”. The UN has criticized this move, saying it would just be creating permanent camps to contain the Rohingya within Myanmar. Myanmar is a Buddhist-majority nation, and the Muslim Rohingya minority has suffered severe oppression for generations. The government has denied them citizenship and refused to recognize them as an ethnic group. Food for the Hungry has been working in Bangladesh since 1971. They primarily serve communities with long-term development programs to enact sustainable solutions to poverty. As FH works with government and humanitarian agencies to provide aid for Rohingya, Owen says they could really use the support and prayers of the Body of Christ. If you’d like to give in support of FH’s aid work among the Rohingya, click here.